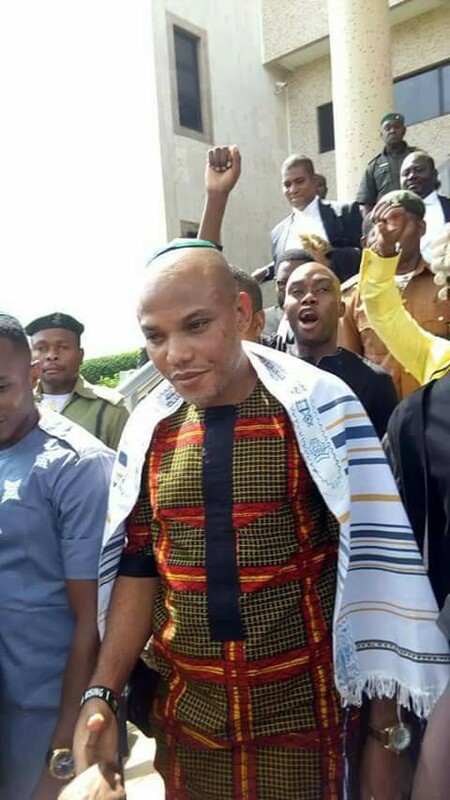 There have been news making rounds on social media that Nnamdi Kanu the Supreme Leader of IPOB worldwide is aligning with PDP Nigerian political party, that he has gained popularity he wanted, that he did not want Igbos to secede from Nigeria, that his intentions is to fight APC led Nigerian government of Muhammadu Buhari, that he apologised to Yoruba people and will form a mega party with them. This is rather laughable and pathetic that this kind of fake news emanated or originated from an APC murderous media syndicates and was carried by mischief makers and some evil, malicious and gullible Nigerian public. The news are lies like those coming from the Nigerian Information minister Alhaji Lai Mohammed the superior lair of the Nigerian state. It will be pertinent to state here unequivocally that the Supreme Leader of the Indigenous People Of Biafra, Mazi Nnamdi Kanu remains whom he is and his quest and resolve to restoring his identity and dignity which is Biafra remains unchanged and unshakeable. The fake news being peddled by the Nigerian government through her media syndicates have been blatantly shredded and debunked by IPOB, Nnamdi Kanu's lawyer and some concerned Nigerians who took to so many media platforms to defend Kanu whose Buhari's court through Justice Binta Nyako took away his right to free speech which barred him from granting interviews and as such pave way for lies against him leading to character assassination. They made it clear to the general public as well as gullible Nigerians that Nnamdi Kanu can never shift-grounds in his resolve to restoring Biafra and his stance and ideology on Biafra remains unshakeable as it is a divine mandate bestowed on him which must be drawn to a successful and logical conclusion. It is now of essence to note that the Nigerian government is an enemy to Nigerians in the sense that the lies being disseminated to the public are deceitful and very misleading of the media outlet(s) peddling the news, but most Nigerians are so gullible that it's difficult for them to differentiate between lies and truth or right and wrong and such information gap contributes to retardation of growth, development and inhibit mutual understanding. Nnamdi Kanu's meeting with some notable Nigerians especially politicians from Biafra extraction has resulted to mixed feelings, misconceptions and misunderstanding among many people. No doubt, the Biafra struggle has entered a different stage yet many did not understand the importance of such diplomatic mission which is pivotal at this level or stage. The recent meeting should not put fear in the minds of people because there is need to carry everybody along hence the struggle has changed strategy and there are international observers watching with keen interest. The Biafra struggle has attracted international communities and as such has become an international phenomenon, so there is need to embark on diplomatic mission in Biafra Land which will eventually be extended to international level paving way for the proposed internationally monitored and recognised referendum. Such move by IPOB leadership should be commended and encouraged because it entails making his intentions known unequivocally to the custodians and political elite in Biafra Land so that they will be well informed about the irreversible and unstoppable nature of quest for restoration of Biafra. It should also send an unmistakable signal to the Nigerian state that Biafrans mean business and that Biafra restoration project cannot be derailed. Furthermore, Nnamdi Kanu and IPOB are not advocating for restructuring of Nigeria or Igbo secession; but a complete and total restoration of Biafra because Biafra existed many years before the evil and fraudulent amalgamation that gave rise to the contraption called Nigeria. However, IPOB remains the Indigenous People of Biafra spearheading the cause for Biafra restoration with her Supreme Leader Mazi Nnamdi Kanu. IPOB in an unequivocal terms is not aligning with politicians and has since inception shut her doors against politicians in Nigeria to devoid the struggle of corruption or being influenced with their corrupt practices because IPOB remains whiter that white and whiter than snow. Moreso, the news that IPOB leadership seeks popularity is as good as no news because Nnamdi Kanu and Radio Biafra started making headlines on news years back though the illegal arrest and unlawful detention of Kanu by the inept government led by the illiterate Daura born Fulani president of Nigeria skyrocketed not just Nnamdi Kanu but also the Biafra struggle to gain much needed popularity, international recognition and sympathy as well which made Biafra more popular in the international stage than Nigeria. In conclusion, IPOB worldwide is a million and one percent in full support of the decisions and actions of her leader Mazi Nnamdi Kanu. IPOB and Nnamdi Kanu are not seceding from Nigeria rather are restoring Biafra. IPOB is not aligning with politicians, groups and parties alike or joining Nigerian politics. IPOB cannot be cowed or intimidated by the Nigerian state; it has not happened and can never happen now or in the future until Nigeria dismembers or disintegrates. IPOB is making bold to say unapologetically that Mazi Nnamdi Kanu her Supreme Leader remains whom he is irrespective of the circumstances he is passing through because in the end it will be WIN WIN WIN. Nnamdi Kanu will never capitulate or compromise his stance on Biafra restoration and it's high time Biafrans put complete faith in him as he has been tasted and must be trusted as well. He will never renounce or denounce Biafra no matter what may. Edited by Orji Munachiso Sandra.